This activity brings together different elements of the curriculum to produce an information leaflet. The aim is to produce an information leaflet to tell people about the saiga and other wildlife on the steppe. The activity can probably be used with children aged from seven to 16. If good leaflets are produced, why not print copies to distribute to local homes, shops and hotels? Discuss who the leaflet is for (local people, tourists). Discuss and identify the most important things you want to tell people about the species you have chosen. Discuss the need to avoid having too many words. 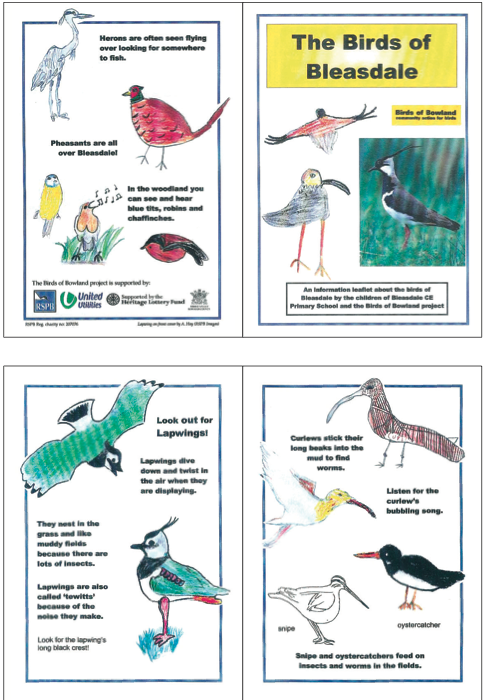 Discuss the need to include colourful pictures to help people to visualise what the birds and other animals look like. An example produced by an English school about their local area is shown here.